Even dressed up, 50 grams of daily fiber is a lot to pack away. If you’ve got type 2 diabetes, the quality of food is as important as the quantity. And fiber is the best stuff around. 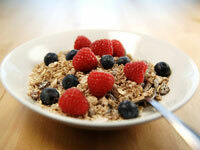 Fiber itself doesn’t raise blood sugar because it can't be digested, and that's good. But even better, it can blunt the impact that carbohydrates have on blood sugar. The reason? The intestines take a bit more time to digest fiber-rich foods, and that slows the release of glucose into your bloodstream. he problem is that 50 grams of fiber per day is a lot of fiber. Most Americans consume only 15 grams every day, according to the American Heart Association, and the American Diabetes Association recommends that people with diabetes eat 25 to 50 grams daily. While it’s tough to consume that much, it’s not impossible. Berry says you can eat the fiber-high foods alone or add them to recipes—for example, put beans in a salad. However, don’t forget to calculate how much carbohydrate you are adding. A half-cup of beans, for example, has the same carbohydrate count as a third-cup of pasta.